An good indication of a breeder's professionalism can be gleaned from learning from the experiences of their customers. Below are letters-- untouched and unsolicited from some of the many people that WINDROCK Inc has had the privilege of placing puppies or ex racing greyhounds with. Note that all of the testimonials have phone numbers or email address. Last winter our family embarked on the search for the perfect pet. 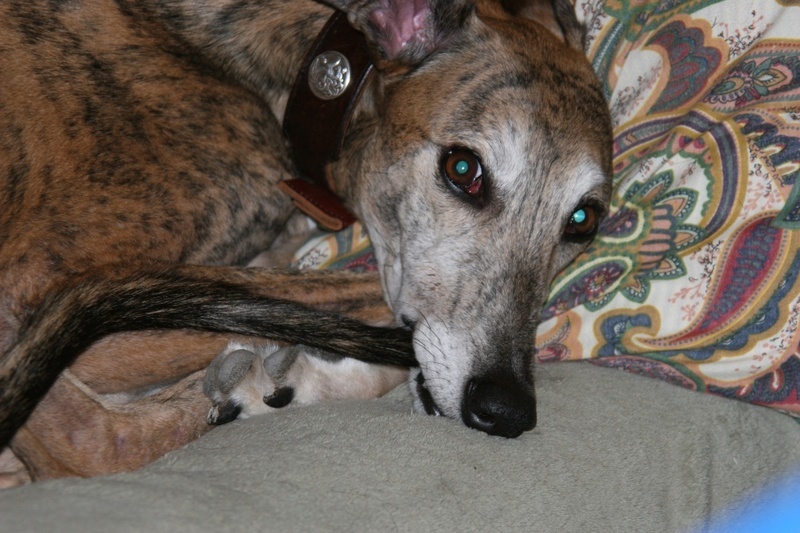 Our research confirmed that a greyhound would be the perfect match for us and an internet search quickly connected us with Windrock. My first conversation with Kim Fritzler lasted nearly an hour and I knew immediately that a wonderful friendship was about to bloom! Kim graciously shared her vast knowledge about greyhounds, teaching us specifically about the breed and puppy ownership in general. 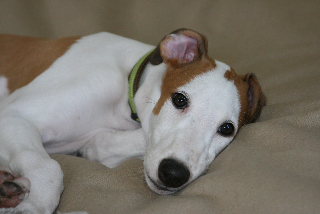 Kim taught me about greyhound health and I was impressed with the measures she takes to ensure healthy pups are born. We were asked to complete a puppy questionnaire, which further confirmed my understanding that Kim wanted only the very best homes for her puppies. We finished the questionnaire and were thrilled upon learning that a Windrock puppy would soon grace our home. We eagerly waited for a Windrock puppy to be born and Kim kept us informed throughout the entire process. We were giddy with excitement when Kim shared that two litters had been born! We indicated that we had hopes for a brindled little girl, but understood that Kim would be watching the puppies as they grew to make sure that the chosen puppy was a good match for our family. In the weeks prior to our brindled beauty’s arrival, Kim helped us prepare by recommending literature and teaching us about basic care and vaccinations. Kim educated us on proper nutrition, even providing tips about where to purchase high-quality food. She also provided guidance regarding our pup’s favorite toys, which we hoped would make the transition to our home easier. We were fully prepared for our puppy’s arrival, excited over sent pictures as we waited in the meantime. Our family welcomed Windrock’s “Take the Keys to my Heart” into our home this summer. We named our adorable girl Roxie Roo and she has warmed our hearts since the very first day. My oldest daughter, Rachel, and I met Roxie at the airport with tears in our eyes. We let her out of her crate, tail wagging, and she immediately rolled over and requested a belly rub! She showered us with kisses and continues to share her love with us every day! It was evident instantly that Roxie was raised in a Colorado home of love for her first few months of life! Roxie gets along beautifully with our three children, who take turns each night sharing their bed with her. Roxie is playful, loves to run and go on neighborhood walks, enjoys the company of visitors, and has learned several tricks. She is also content snuggling in front of the fireplace, nuzzling her face next to ours. The mentorship between Kim and our family continues, as she has been available for consult across the miles. Kim sent us pictures of Roxie’s parents, as well as a special medal earned by Roxie’s father. She has also recently provided advice on preventing “counter surfing!” We have also taken delight in calling Kim simply to share how well Roxie is doing and convey how much we adore her! We feel so blessed to have been chosen to raise Roxie… She is a special gift! 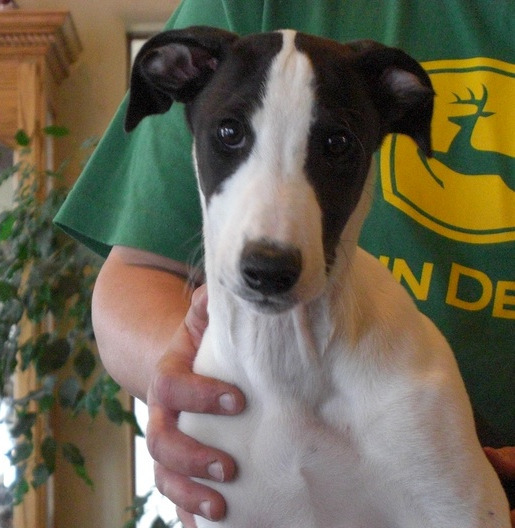 We were so excited to meet "Duncan", our male puppy greyhound, at JKF airport. He arrived in his crate with a leash, toys, and the warmest heart. He immediately started to sniff and get to know us~me and my two sons. He was sweet, responsive and affectionate. He was also so excited to see that we had prepared spaces around the house for him with dog beds and toys. At home he would come sit with us AND also let us know when he needed to use the bathroom--at just three months! His mom in Colorado, "Whisper" did a great job of training him to go outside when Nature called. Kim was great about sending paperwork on his shots and on his most recent veterinarian visits. Kim was also so attentive with checking up on Duncan after he arrived and offering her time and advice if we had any questions. Getting Duncan and caring for him was so easy from the beginning because Kim and his mom Whisper had already done a great job! I am glad to say that Duncan is still doing great now--getting much bigger and more active, and of course, enjoying all the love we shower him with. No matter how bad our day has been, Duncan makes things brighter when we get home. Words cannot express how much we love him! While showing my whippet at the Lompoc, CA shows in 2007, accompanied by my dear friend and Windrock greyhound owner, Jackie Vano, I was lucky enough to meet Kim and Colin Fritzler. I was and remain impressed by how willing they both are to share what they've learned, in the many years of breeding, raising, training, exhibiting, coursing and loving their beautiful greyhounds. Due to my dear friend Jackie's generosity, I have become a co-owner of one of Ayden and Whisper's baby from their first litter, "The WILD Bunch". Knowing Kim and Colin's dogs have completely changed my feelings about greyhounds. 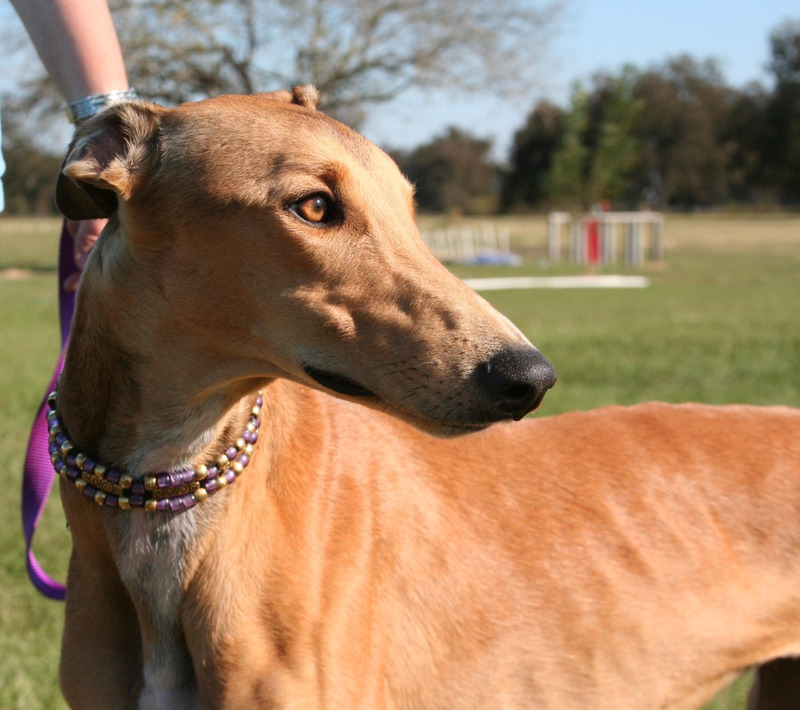 From being around greyhounds at dog shows, I always was drawn to their beauty, but was put off by their aloofness and what seemed to be disinterest in people. Knowing Jackie's Windrock hounds, and especially our "OREO" aka Windrock Wild Card, has completely changed my mind!Their dogs have tremendous personalities and are extremely loving and personable...even to strangers! Having been involved with showing dogs for 25 years, you experience all sorts of personalities. 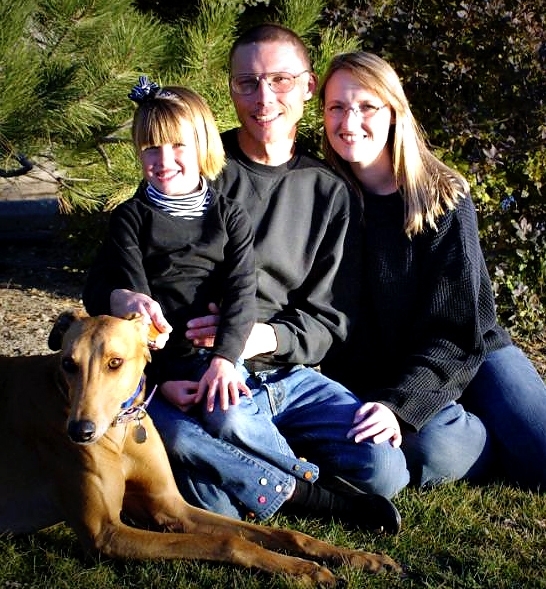 Kim and Colin are completely committed to providing the absolute best for their hounds, which includes making the best matches to each situation..the key to successful dog-to-human relationships. As responsible breeders, the Fritzlers stand in a class by themselves! I have known Kim for almost four years now. 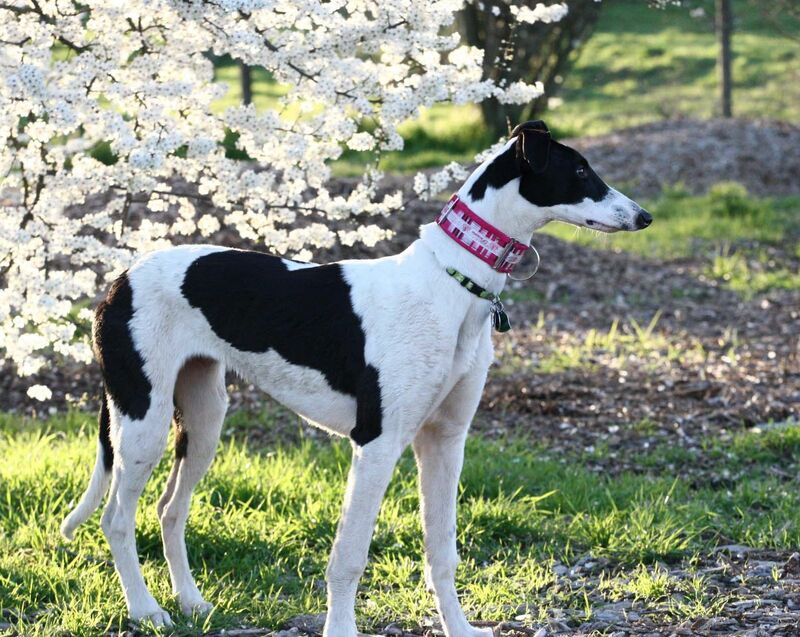 When I first started looking for the perfect greyhound, I came across Kim and her breeding and decided that her line was the line I wanted to found my greyhounds on. I talked to Kim for quite a while, waiting for Naughty to come in heat, be bred, then have the pups. Through the whole process, Kim kept in constant contact with me. I had told Kim I wanted a female to show, course and breed, in other words, I wanted her best, and I got it when I got Eowyn (Windrock My Precious). She was absolutely everything I had wanted in a greyhound. 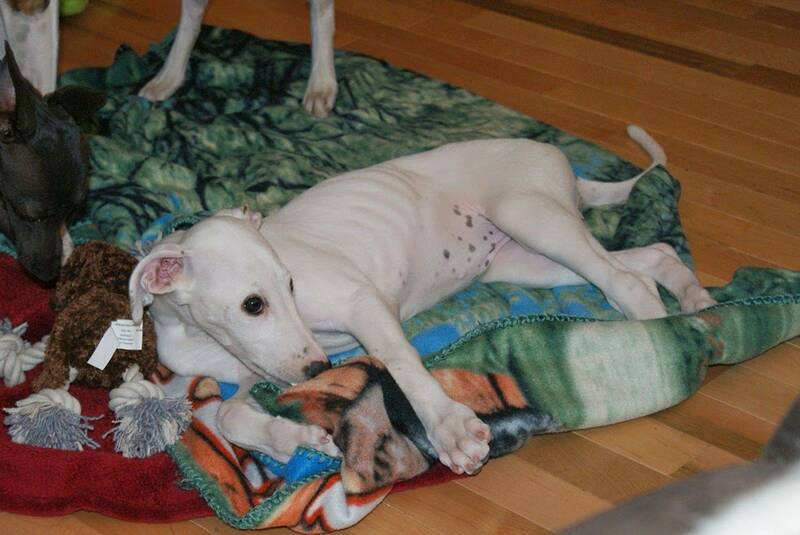 Unfortunately, Eowyn contracted a very rare form of distemper when she was two years old. I took her to specialists, had spinal fluid pulled, had a CAT SCAN and an MRI done to try to find out what was wrong. The vets were stumped and the specialists told me that it was just one of those things that no one could have prepared for or prevented. It was not hereditary, and it wasn't something that I had done wrong. Through all of this, Kim called me daily to check on Eowyn, she gave me encouragement when I was just beside myself, and she gave me comfort when it came time to let Eowyn go. I had had high hopes for Eowyn and was devastated when she died. I didn’t expect anything from Kim because there was nothing hereditary wrong with Eowyn, so she wasn’t responsible. 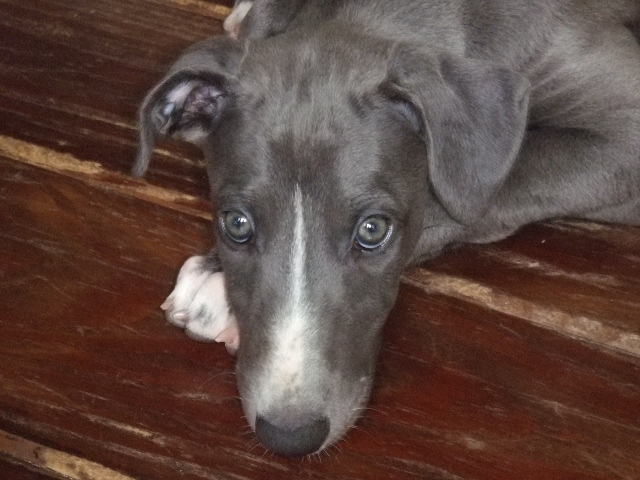 However, Kim is such a wonderful person that she couldn’t stand the fact that I didn’t have a greyhound puppy to show, course and breed. At first I was so upset that I just couldn’t think about what I wanted, but Kim didn’t give up on me. When Whisper had her latest litter, Kim called me and said, I have the perfect little boy for you; you just have to have him. Kim knew that I couldn’t afford to pay for another puppy, and she didn’t even ask me to. She replaced Eowyn on her own because she is a compassionate person and she cares about not only the pups she breeds, but the people who buy pups from her. I drove to Colorado to pick up my new pup this summer, and I have been SO happy! Kim was wonderful to my nieces and me when we arrived. She showed me all of the pups, all of the grown dogs, stacked everyone up for me to look at, and just let me have the run of her kennels. Kim is a wonderful person. I cannot thank her enough for trusting me again with my new pup, Rhaegar. He has the same fantastic personality that Eowyn had. He’s great with my three boys and confident enough to go anywhere and try anything. It is quite obvious that he has great breeding and was well socialized when he was young. Kim spends time with every one of her dogs and makes sure those that get a dog from her get the best. I’m so glad that people like Kim still exist! I would recommend Kim as a breeder to anyone who wants a great greyhound and a wonderful breeder and teacher to go along with it!! We are so happy that we found Windrock and our Cooper. have been inseparable from him ever since we picked him up at the airport. He has such a sweet disposition and has been a joy to have. We want to thank you Kim for being so helpful. We appreciate you always being there to answer our questions and provide helpful guidance. Thanks for making the entire process of adopting Cooper very easy and stress free. We look forward to sharing pictures and stories of Cooper with you as he grows. Thanks again for bringing this special guy into our lives. enjoying him very much. Thank you! 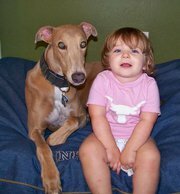 We first contacted Windrock Inc out of Grand Junction, Colorado in regards to purchasing a show quality greyhound dog. This took place several months ago via the internet and then by phone. 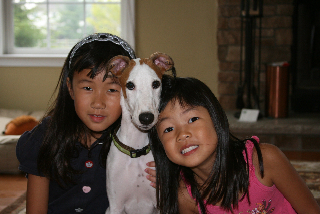 June 24th, 2009, we drove to Grand Junction to purchase the dog. We have been showing dogs for over 14 years now and have found that the majority of breeders we have dealt with were honest and true to their word. There have been only 2 occasions to the contrary. Our dealings with Windrock, Kimberly & Colin Fritzler have been above and beyond fantastic. The professionalism and courtesy shown to us by Kim and her husband Colin exceeded our expectations. Not only was the Kennel itself amazingly clean and orderly, but all of the dogs were in excellent condition. 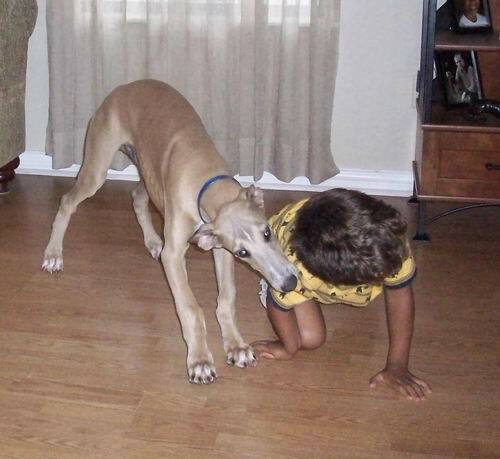 We were impressed with their knowledge of caring for greyhounds and dogs in general. They provided us with an arm load of written information and documents pertaining to their breeding history and philosophy of dog showing. It was refreshing to have people that care enough about their animals to actually check out our references including the vets we used. The proposed contract was emailed to us prior to us deciding whether to purchase/adopt. It was legal and binding on both ends. We were not made to sign it in blood either. We could not have been more satisfied with this adoption/purchase of a dog. They went above and beyond to help us secure our dream dog. We look forward to being a large part of their future breeding with our new boy. They are not just our breeders but have become lifelong friends. We would without question highly recommend Windrock Inc to anyone with a true desire and heart to show/breed greyhounds. Little Lily is bringing so much joy (and activity) to my home. She certainly is an American Dream! You were so kind and helpful when I came to get my little girl, I felt like we had been friends forever. Thank you for showing me all your greyhounds, they certainly are a healthy and happy bunch. I could tell that that they were all "part of the family". I will keep you updated with pictures and thanks again for such a wonderful puppy. My family was leery about buying a dog on-line. We had heard so many horror stories about people being "taken". We had reservations and needed reassurance. We searched extensively to find a reputable breeder. Someone who wouldn't just take our money and disappear. Someone who would be there if we had questions or concerns. I am glad that we found Kim Fritzler as she was by far the most professional and knowledgeable of the people we contacted. She asked me almost as many questions as I had of her. We were thrilled that we won Kim's approval and were allowed to adopt Sophie. Seven years ago a breeder referred me to Kim. I found Kim knowledgeable and forthright in her manner, answering my questions in detail. She took the time to be helpful to me. 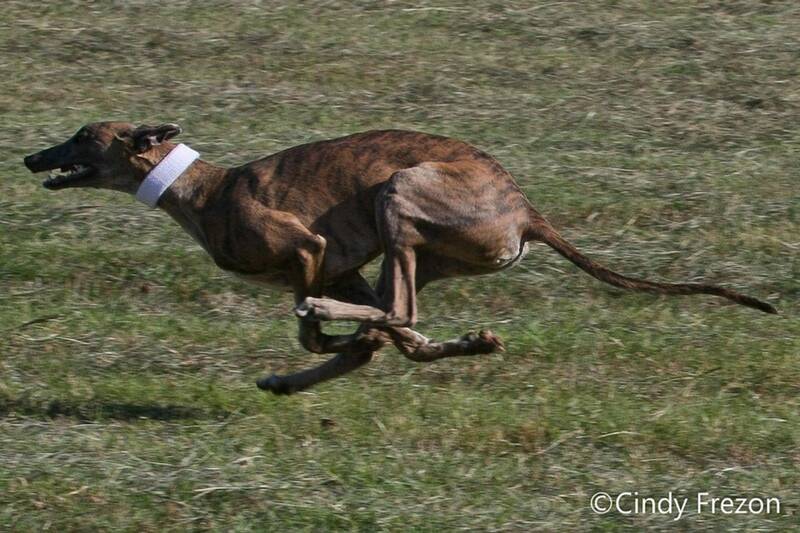 Years later, I contacted Kim as I was wanting a Greyhound I could show in conformation and lure coursing. I put it bluntly to Kim--would she sell me a good one? The puppy she sent me proved she is as good as her word. "Ryan" in his inaugural year in competition was more than I could ever imagined. Ch. Windrock Blue Sky Morning has exceeded my wildest expectations! Kim and I have formed a good friendship and she continues to mentor me. Kim is what is known as “a good breeder of dogs” and I am most fortunate to know her. I want to let people know what wonderful people Kim Fritzler and her husband Colin are. They go under the name of WINDROCK. I spent a few days with them when purchasing a puppy from them. I wanted a top show dog. I got one from the Fritzlers, Windrock Scarlet O'Hara. I only showed her for 4 months and she has 10 points, 3 Puppy Group Firsts, A Best In Sweeps, and multiple BOB wins, some over specials. I never expected that much. Colin drove to the Grand Junction Airport to pick me up and drove me to their home in Clifton. I met all of their lovely dogs that night after being with Minx (my new puppy) during the day. When the dogs came into the house they were all well-behaved and arranged themselves on the furniture with the Fritzlers. The next day, the Fritzlers drove me into town and helped me acquire a crate for Minx to ship her back with me. Since I knew that the small aircraft which had flown from Denver to Grand Junction couldn't accommodate this size of crate, I had rented a car for the 4 hour trip back to Denver on Sunday. That evening after a delicious home cooked meal, Colin asked me how I was getting back to Denver. I told him I had rented a SUV, just in case the weather was inclement. He didn't approve. He told me that I'd be on an unfamiliar mountainous road for 4 hours and there would likely be icy spots, so he told me he would drive me to Denver. I accepted his gracious offer. The trip back to Denver the next morning was spectacular! The majesty of the Rockies and the scenery was breath-taking which I will keep with me for the rest of my life. Pictures just don't do it justice. The Fritzlers spend 8 hours of their very busy day to make sure Mix and I arrived safely at my hotel in Denver. They also took measures to ensure my puppy's crate could be very easily identified so I wouldn't worry needlessly. I would buy a puppy from these lovely people again. They are hospitable, honest, courteous and more than go out of their way for puppy buyers and help even with advice for dogs that they don't own or haven't bred. I only hope that they will be around the next time I want to get another puppy, because I have bought puppies from other people who will never measure up to the standards that the Fritzlers have set for themselves. 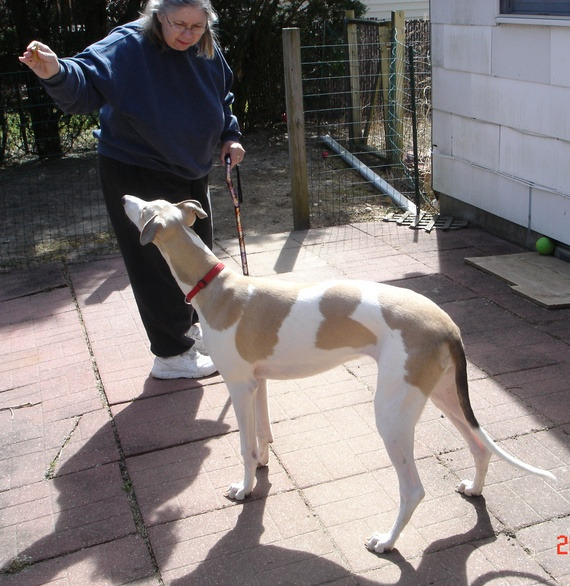 Barbara R. Cohen--Proud owner of a WINDROCK greyhound! I would like to let you know that we have had our greyhound, for almost a year. He is doing well and I could not ask for a better dog. This placement was a perfect match and I appreciate you taking the time to help me with any questions I have asked over the year. I am so pleased to have found a person who is so knowledgeable about this breed. Please feel free to use my testimonial to any other person who is looking for one of these beautiful, sweet dogs. The other owners ask me if he will chase a ball and I have to say "No, but he'll chase your dog chasing the ball!" Physically he is really good. He is currently on a low-calorie dog food to help shed some of the extra weight he gained from another food that I fed him that had a little too much fat...We did have a scare earlier this summer when he decided to steal a corndog and swallow it whole...stick and all!! They had to knock him out and go in through his throat to take it out. He has thus earned the nickname "Corndog!" I've gotten good at trimming his nails and he's even had a few baths in the bathtub! And other than the normal cuts and scrapes, no major injuries! He's got quite the personality and even though he has a nice collection of stuffed animals of his own...will often be found sneaking into Heather's room to steal one of hers. Usually it is whichever one she really LOVES at the time! He usually sleeps in his crate at night (unlocked) but does tend to crawl in bed with us if he gets cold. Good thing we have a huge king sized bed! this winter he may get a bed warmer! LOL! We never did end up getting another dog. Not sure why, but it just never seemed to be the right time or the right dog. We haven't totally decided not to get another one...but we aren't in any hurry either. We'll just see what happens.